NOTICE: Activation key must be used on a valid Steam account, requires internet connection. ABOUT THE GAME	State of Decay, along with major Add-Ons Breakdown and Lifeline, is now fully remastered in stunning 1080p. New missions, weapons, and extra content, along with improved lighting, textures, animations and combat mechanics, will pull you even deeper into the post-outbreak world. How wi… ll you survive the zombie apocalypse? KEY FEATURES New Missions: Mysterious supply crates start dropping into remote areas across the map, attracting massive hordes of zombies. Wipe out the infestation and you can grab some of the rarest and most powerful equipment seen in State of Decay. New Survivors: Your favorite characters from Lifeline can now be unlocked in Breakdown, including the previously unplayable Kelly “Sasquatch” Eldridge. New Vehicles: Not only do players get a brand-new SUV, but custom vehicle skins are also distributed across all maps for greater personalization. New Weapons: Under-Barrel Grenade Launchers and Incendiary Shotguns. Find new assault rifles equipped with under-barrel grenade launcher attachments as well as shotguns that fire incendiary rounds. Make your stand against the collapse of society in the ultimate zombie survival-fantasy game. Explore an open world full of dangers and opportunities that respond to your every decision. Recruit a community of playable survivors, each with their own unique skills and talents. Design and fortify your base against the relentless hordes of the undead. Perform daring raids for food and ammunition, and do whatever it takes to live another day. SYSTEM REQUIREMENTS Minimum: OS: Windows 7 Processor: Intel Core 2 Duo E6600 / Athlon X64 3400 Memory: 4 GB RAM Graphics: GeForce GTX 470 / Radeon HD 5850 / Intel HD 4600 DirectX: Version 11 Storage: 4158 MB available space Recommended: OS: Windows 7 / Windows 8 Processor: Intel Core i5-750 / AMD Athlon X4 760K Memory: 8 GB RAM Graphics: GeForce GTX 560 / Radeon HD 7770 DirectX: Version 11 Storage: 4200 MB available space © 2015 Microsoft Corporation. 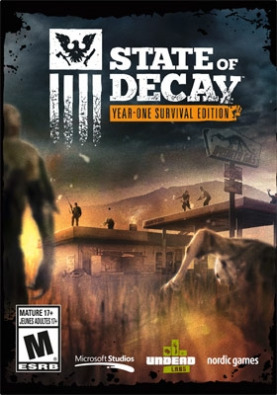 Microsoft and State of Decay are trademarks of the Microsoft group of companies.